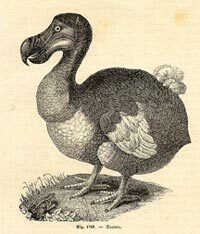 Although this bird was called the DODO, 1598 - 1681 an extinct, flightless bird that lived on the island of Mauritius, the star and key of the Indian Ocean, near Africa, wasn't a stupid bird. When visitors to the island of Mauritius, off the coast of Africa, first saw the bird, they thought its friendly approach meant the bird was dumb. Gray in color, the dodo bird may have been a relative of the pigeon family. It had a large, hooked beak and white feathers attached to its tail. This wingless bird had no enemies on the island and was safe living on the ground. In 1581, when dogs and pigs were brought onto the island, things changed. Man introduced other new species and started hunting the dodo bird. Eventually, the dodo became extinct. Although the exact date isn't certain, people believe these birds were last seen around 1681. With the extinction of the dodo, hence the phrase "dead as a dodo," came the end of the Calvaria tree because it relied on the dodo to spread its seeds. When the dodo ate the fruit from the tree, it couldn't digest it and would poop it out. (Think of a bad burrito experience.) This is how the seeds were spread. No dodo droppings - no Calvaria tree. There are no dodos today for scientist to examine, and paintings and drawings of this wingless bird are all very different in size. Known technically as Raphus Cucullatus, some scientists believe the dodo was extremely overweight while others think it was much thinner and a running bird, like an Ostrich. With no complete skeleton, scientist can only guess. There once was an island in the middle of the Indian Ocean. It was a peaceful island, filled with unusual creatures. One of the most interesting of these animals was a large, gentle species of bird. These birds had lived on the island for so long that they had forgotten how to fly. Why should they? Everything they needed was right there on the island. One day, a ship arrived full of strange and rowdy creatures. The gentle birds were curious, having never seen such a happening on their island before, and so they went out to investigate. One by one they went to see the visitors and, one by one, they were struck down. Some were taken for food. Some were taken for sport. Some were destroyed out of boredom. The reasons never really mattered; soon all of the big, gentle birds were gone, never to return. The visitors, deprived of their sport, moved on searching for another island, destined to repeat themselves again. The island was the island of Mauritius. The birds were the dodos. The visitors were the Dutch sailors who settled the island. The time period was less than one hundred years from discovery to extinction. We owe it to the dodos to make sure we never make the same mistake again.